Distance from city center: 8 km. Which airlines fly to Kota Kinabalu International Airport? There are more airlines flying to Kota Kinabalu International Airport. See here for a complete list of airlines flying to Kota Kinabalu International Airport or look for flights to Kota Kinabalu. How many runways and passenger terminals does Kota Kinabalu International Airport have? The airport has two terminals, the old terminal constructed in 1957 (Terminal 2) and a newer terminal (1) build in the 1980's which was heavily renovated a few years back. Terminal 2 is now only used for charter flights and cargo handling. With the extensions and renovations of 2015 of the terminals and runway, the Kota Kinabalu Airport is the second airport in Malaysia that is capable of handling the Airbus A380 SuperJumbo, the biggest commercial airplane in the world. Where is Kota Kinabalu International Airport located? 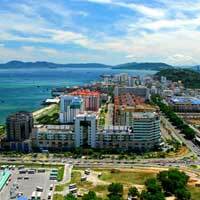 The airport is located only 7 km south from downtown Kota Kinabalu. How to get from the airport to Kota Kinabalu city centre by public transport? A new Airport bus greatly improves public transport at the airport. The Airport buses leave every hour to Kota Kinabalu and have three stops in the center: Center Point, Horizon Hotel and Padang Merdeka. Prices are RM 5 for adults and RM 3 for children.The buses operate between 08:00 and 20:30. How much does a taxi cost from the airport to Kota Kinabalu city centre? Pre-paid taxi coupons are available at the counter in the terminal. For a trip to the city which will take about 15 minutes, expect to pay RM 30. Prices are 50% higher after midnight till 6:00 am. What are popular destinations from Kota Kinabalu International Airport?